Venezuela has issued new larger denomination banknotes in response to the country's soaring rate of inflation, BBC reports. The three notes, ranging from 500 to 20,000-bolivars, have entered circulation with the aim of making paying for essentials easier. Inflation in Venezuela is forecast to reach 1,600% this year. Until now, the 100-bolivar note had been the country's largest, worth just three US cents on the black market. The new bills are aimed at making transactions easier for Venezuelans, who have had to carry huge book-size wads of cash to pay for basic items. 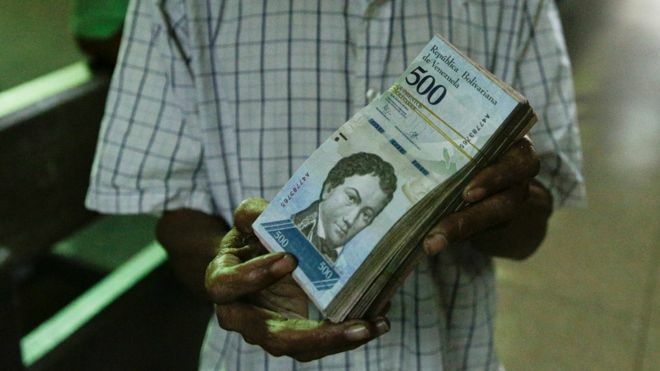 However the new 20,000-bolivar note is still worth less than $6 (£5) on the black market, which Venezuelans frequently turn to if they are unable to purchase official-rate dollars.